Presaddfed burial chambers just before sunset. 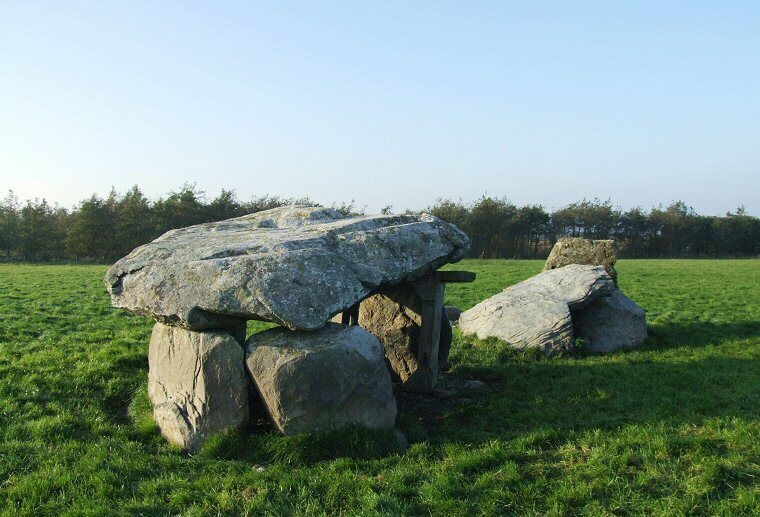 In an open field just 100 metres south of the Llyn Llywenan lake are the remains of a pair of Neolithic burial chambers and although they stand only a couple of metres apart it is not clear if they formed part of the same monument or are two separate tombs. A report in the Archaeological Journal from the mid 19th century states that they were surrounded by 'a great number of small stones' which may suggest they were once connected by a single covering cairn much like the tombs of Trefignath 9km (5 miles) to the west however no trace of these stones remain so the original form of the monument is open to interpretation. The northern tomb is badly damaged with only two remaining uprights towards the north and a tumbled capstone leaning against them, the chamber was already in a collapsed state when the site was recorded in the late 18th century. 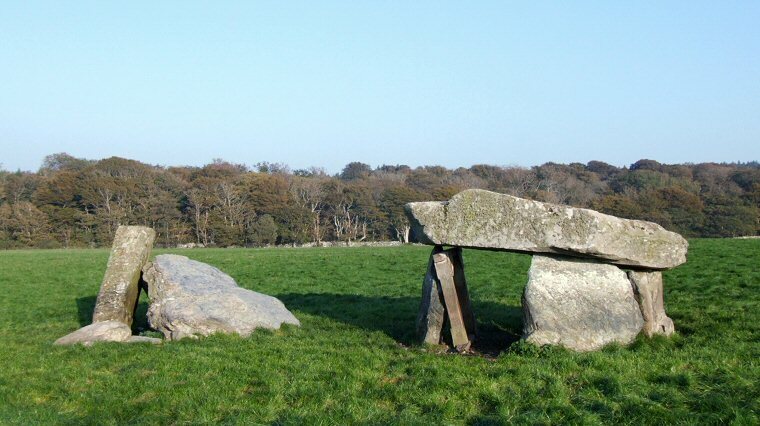 The southern chamber is better preserved and has a 4 x 3 metre capstone just over half metre thick that slopes towards the south where it rests on three uprights and although there is a single slender upright at the north the capstone is partly supported here by a sturdy wooden frame. This is a picturesque site but when I visited it in summer 2001 I was unable to enter the field due to it being closed under Foot and Mouth restrictions. Update: Autumn 2010, I finally made it back to Anglesey and took the photographs on this page, it appears that the large wooden frame is no longer supporting the capstone but is in fact leaning against the northern upright of the chamber. Presaddfed burial chambers, the redundant wooden frame is clearly visible in this picture.